Hamilton Beach 35200 Deep Fryer Adjustable Timer Immersed Heating Element NEW! 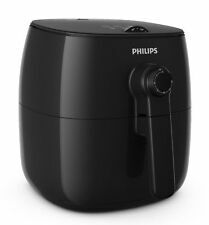 Philips TurboStar Digital Air Fryer Black - Brand New! ★ Cooks healthier food with 80% less fat! This air fryer is perfect for frying, baking, grilling and roasting with little to no oil, the BEST gift ever! ★ Considerable Design! - XL Big 3.7 Qt. capacity, feeds up to a family of FOUR and can fit in any countertop. Using Dynamic AirFlow Technology to circulate hot air inside, the Frenchmay Air fryer cooks foods quickly and evenly with little to no preheating required. Healthy cooking - eat fried food without the guild and extra calories! Stainless steel construction for electric 1-tank fryer. 1 x Single Tank Stainless Steel Deep Fryer. Enclosed special basket used for frying small piece of food. A hanger and a handle on the basket, easy to filter oil. Gourmia GAF680 Digital Multi Mode Air Fryer | Oil-Free Healthy Cooking | 8 Preset Cook Modes | 6-Quart Capacity | Stainless Steel Design | Removable, Dishwasher-Safe Basket. Power: 1800W. 1 x 1800W Electric Air Fryer. 【FAMILY SIZE | MORE CAPACITY】This XL low fat air deep fryer can hold 5.5 liters (5.8 QT) which makes cooking for the family a piece of cake! 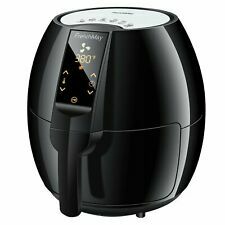 【VERSATILE COOKING | FRY ROAST】This XL Air Fryer multi cooker is essentially a fryer, oven and grill all in one. Want to eat healthier without giving up the decadence of fried foods?. The Insignia Air Fryer is your solution. The technology cooks your food using little to no oil, resulting in a tasty, healthier alternative to deep frying. Tank Capacity: 12L(6L for each tank). 1x Dual Tank Stainless Steel Deep Fryer. This dual-tank fryer has separate power plugs for each tank. Dual power plugs design for single/dual tank application. Food shown in the pictures not included. Best Choice Products 11.6qt 1700W 8-in-1 XL Air Fryer Oven, Rotisserie, Dehydrator Kitchen Cooking Set w/ 8 Accessories. 6qt Rotating Basket: 5.5"(Dia) x 8"(L). Taking your cooking to a healthy new level is easier than ever with this 8-in-1 multifunctional air fryer oven. Crispy, golden goodness without the unwanted calories! Craving the irresistible crunch of your favorite fried foods?. The best part?. Features: 5 qt. /4.7L capacity Designed for the modern kitchen and perfect for families 8 One-Touch Presets Tap-to-fry modes for great convenience. 4.5 out of 5 stars - Big Boss 1300-Watt Oil-Less Air Fryer, 16-Quart - Copper, As Seen on TV, NEW! 94 product ratings94 product ratings - Big Boss 1300-Watt Oil-Less Air Fryer, 16-Quart - Copper, As Seen on TV, NEW! Electric Hot Air Fryer 5.9QT Family Size Oven Oilless Cooker. 5.5L XXL Large Air Fryer for Entire Family --- Cook an entire chicken is no problem! Make fries just as tasty as in a conventional deep fryer but in a healthier way. 4.5 out of 5 stars - Big Boss Air Fryer Healthy 1300W XL 16-Quart + 50 Recipe Cookbook, 7 Colors! 30 product ratings30 product ratings - Big Boss Air Fryer Healthy 1300W XL 16-Quart + 50 Recipe Cookbook, 7 Colors! Power: 1700W. 1 x 1700W Electric Air Fryer. Detachable basket for easy transfer from the fryer to a serving dish; Equipped with a carry handle for easy transportation. Revolutionary fan technology virtually eliminates unnecessary fats and oils. Best Choice Products 12.4qt 1700W 12-in-1 Programmable XL Air Fryer Oven, Rotisserie, Dehydrator Set w/ 7 Accessories. Taking your cooking to a healthy new level is easier than ever with this 12-in-1 multifunctional air fryer oven. Enjoy all of your favorite fried foods without the guilt! The Power Air Fryer Oven replaces many of your kitchen appliances for crisp, healthy, delicious food. This state-of-the-art air fryer uses little to no oil, relying instead on the power of heated air up to 400°F. Hamilton Beach (35021) Deep Fryer, Cool Touch With Basket, 2 Liter Oil Capacity, Electric, Professional Grade. Item model number: 35021. COOL-TOUCH SIDES & BREAKAWAY CORD: Safety features include cool-touch sides that won’t burn hands if touched accidentally. Infrared Halogen Convection Oven Digital Countertop Air Fryer 1400-Watt 17 Quart. Condition is New. Craving the irresistible crunch of your favorite fried foods?. Digital Air Fryer. Crispy, golden goodness without the unwanted calories! The best part?. Tap-to-fry modes for great convenience. You are purchasing aGourmia Air Fryer Digital Multi Mode 6qt Quart Air Fryer. 1700W of power. Accommodates many foods for a variety of cooking options. Cool touch exterior. These are estimates! We apologize for your inconvenience. For efficient performance. Make: Power AirFryer. Enjoy all of your favorite fried foods without the guilt! The Power AirFryer Oven replaces many of your kitchen appliances for crisp, healthy, delicious food. This state-of-the-art air fryer uses little to no oil, relying instead on the power of superheated air up to 400F. 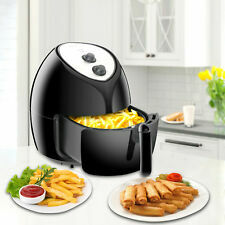 Make delicious and tasty french fries, onion rings and more with this fun-sized deep fryer. It’s equipped with 900 watts of power to heat up quickly and fry fast with consistently crispy, always delicious results. 4-quart ceramic-coated basket fits 2 lbs. 4-Quart Ceramic-Coated, Basket fits 2lbs. of French fries. Includes: Nonstick pan, Wire Rack, Recipes, Instruction Manual. Care & Cleaning: Dishwasher-safe Parts, spot or wipe clean. Taking your cooking to a healthy new level is easier than ever with this 12-in-1 multifunctional air fryer oven. 360-degree rotating system for rotisserie style cooking to roast and barbecue your food to tender deliciousness, plus a defrost and preheat function. Wish you could munch on your favorite fried foods without the guilt?. Now you can skip the greasy fat and still indulge in crispy, crunchy pleasure with this digital air fryer from Gourmia. With gorgeous, low-maintenance stainless steel exterior and a sleek digital display, this powerful appliance cooks up delectable dishes without the need for oil. Easy to operate and clean. It is great for cooking French Fries, onion rings, egg rolls, fried chicken, panko shrimp and any other deep fried food. Temperature indicator light displays when the fryer is heating the oil. Make delicious and tasty French fries, onion rings and more with this fun-sized deep fryer. It's equipped with 900 watts of power to heat up quickly and fry fast with consistently crispy, always delicious results. Prepare your favorite fried foods in the comfort of your own home with 4 Liter Deep Fryer by Chef Buddy. There are 2 smaller baskets, and 1 large basket so you can cook 2 different foods at one time without mixing them together. 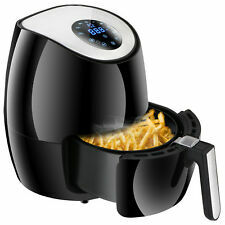 Product Features: 2 Small Baskets and 1 Large Basket Oil Capacity: 4 Liters Adjustable Thermostat Control ranges from 250 degrees to 375 degrees F.
By combining a powerful heater and motor with our new Twin TurboStar technology, the hot air in the Airfryer swirls like a powerful tornado – throughout the entire cooking basket. The Airfryer XXL handles much more than just frying. Its compact size makes it easy to save space in your kitchen and its 0.9L capacity is great for whipping up small portions up to four servings. When your food has browned to your liking, open the fryer and serve the food onto a plate with paper towels using the heat-resistant removable basket. Deep fries six servings in handy steam/fry basket; Heavy cast aluminum base for even heat distribution. 120 volts, 60 Hz only. Get Yours Now for the Best Quality & Price in the Market.